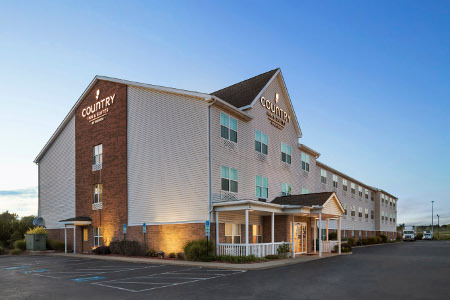 Choose the Country Inn & Suites® by Radisson, Elyria, OH as your home base in northeastern Ohio near Lake Erie. Our hotel is perfect for visiting downtown Cleveland, 30 minutes away, or meeting your student at Oberlin College and Conservatory, 20 minutes away. 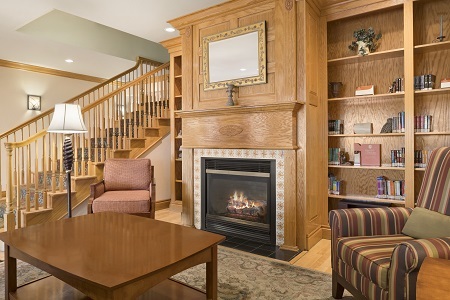 You can also browse souvenir shops at Midway Mall, feel the thrills at Cedar Point amusement park or catch a Shakespearean play at Stocker Arts Center before returning to the hotel to recharge. Ideal for extended stays, our One-bedroom Suites include a private bedroom with a king bed and a separate living room with a sleeper sofa. 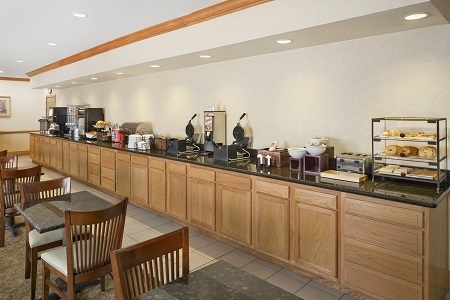 Quiet a growling stomach with the hotel’s free, hot breakfast, featuring bagels with cream cheese, Belgian waffles, pastries, eggs, and bacon or sausage. For lunch or dinner, treat the whole family to a deli sandwich and a cheesecake slice at Rubin’s Deli and Restaurant. You can also dive into Red Lobster’s famous Cheddar Bay Biscuits or try one of the other nearby dining options. Stocker Arts Center – Theatrical performances are just 10 minutes away at Stocker Arts Center on the campus of Lorain County Community College. You can also browse the works of students and professional artists at the campus art gallery. Lakeview Park – At this nearby park, you can sunbathe along the shores of Lake Erie, stroll through the historical rose garden and photograph the Lorain Lighthouse that’s within view of the park. Stick around for the breathtaking sunset over Lake Erie. Cedar Point – Test your thrill-seeking limits aboard some of the world’s fastest and tallest roller coasters at Cedar Point amusement park, just 30 minutes away. After spine-tingling rides, cool off at Cedar Point Shores Waterpark. 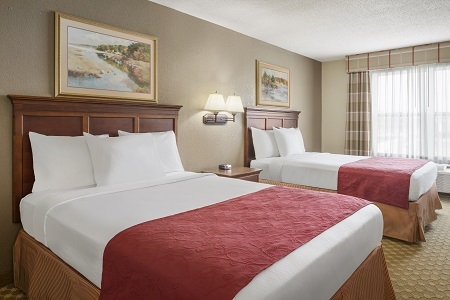 Our meeting room is perfect for guests coming from both Cleveland and Sandusky, and with our location near I-80 and I-90, access couldn’t be easier. Take advantage of audiovisual equipment, catering recommendations and planning assistance to ensure your meeting’s success. We also welcome teams through our Sports Approved Program.